Everybody wants to have loving people around them – people who are supportive, motivational and inspirational. However, there will be some individuals who drain the drive force of life in us by instilling anger, narcissism, fear, neediness and through criticism. When we allow such "energy vampires" to live in our company, we often get frustrated and worn out many times. We face a lot of discouragement as a result. These vampires are usually difficult to handle and bring negative energy to us. They usually consume our vigor. This vampire usually has an exaggerated sense of power and self-importance and always looks for attention and ceaseless praise. They can at times be very obsessed with their ego. However, others can be very intelligent, charming and masterful seducers. The poor and vulnerable always fall prey to these narcissist vampires. Once you disagree with the narcissists, they tend to be aggressive with you. Commonly regarded as the Sarah Bernhardt of vampire, the drama queen vampires often amplify small incidents by creating a big scene from them. They are extremists both for the bad and the good. They move from one crisis to the next and like being in chaos. They are melodramatic and can easily wipe you out by putting you in an overload situation. These energy vampires show anger by smiling or through an exaggerated concern. They are usually very calm. They are talented in putting a fine face amidst hostility. Usually, they keep procrastinating things and claim to have forgotten certain issues just to evade commitments. They will never give you direct answers and can be frustrating due to their seductive nature. This vampire is comparable to a fixer-upper house that is in need of constant repairs. Some can make you their therapist – calling you to fix problems for them. As a friend, you can really be wasted by the constant calls for help. Others are those you would personally see they need help but, however much you help, they are not willing to change. These types of vampires are renowned blamers and martyrs. They are usually full of drama but are not there to take any blame. They are masters at your own insecurities and will focus on such to make you have bad feelings concerning a certain thing. They present themselves as spotless and clean on matters that seem to affect them and usually transfer the blame elsewhere. It is very important to take enough breath when faced with a stressful situation invoked by a vampire. Breathing is important to calm you and give you reassurance that the matter at hand can be dealt with comfortably. Remember your individual power despite what is happening around. It may appear intimidating but a deep sigh can assure you of great relief. This gives you courage to face the situation calmly and confidently. 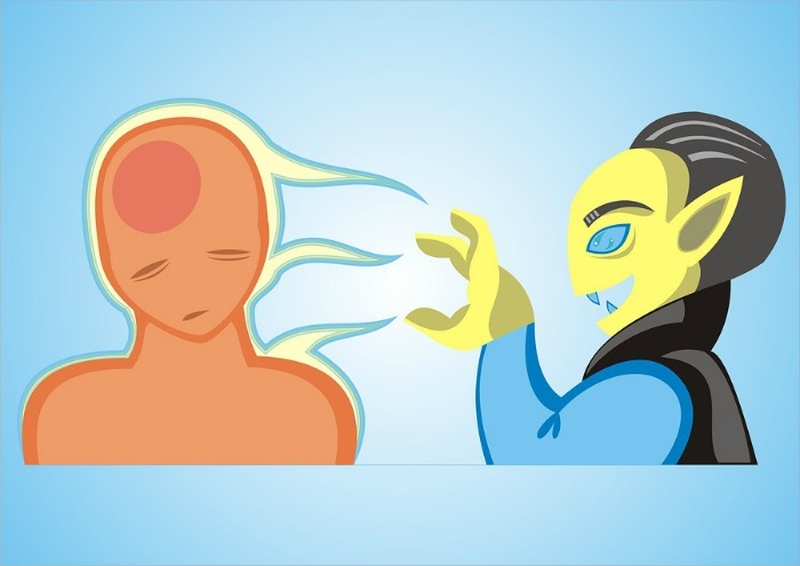 The effects of an energy vampire can be dealt with through the use of personal energy. Get an energy shield in your surrounding and protect yourself. This is a very useful approach in dealing with the person who is casting out spells against you. It will do some effort to stop such attacks from the vampire. It works by creating a buffer zone of where the negative effects are dissipated. Setting boundaries is one way of dealing with energy suckers. This requires you to declare what you can do and what you can't. You don't have to make him understand. There is no point of convincing the vampire why the choices you have made. They may drag you into their arguments. Don't defend any of your stands. Just keep it neutral and go by what you say. Don't react to anything from anyone pushing you to speak. One of the best ways to deal with energy vampires is to stay away from their company. If you realize that somebody is likely to drain your energy, it is a very prudent idea to avoid them in advance. Beware of the people who always worsen your life. The law of energy states that we normally attract what we have not yet dealt with. Don't pay attention to energy draining people. Make sure you are not in contact with them. This is a common practice for many people who have encountered energy vampires in their lives. Though it looks a natural response, the folded position of your arms on the chest is useful for protecting the solar plexus chakra. The solar plexus chakra is the center of a person's power. To further augment this response, you can also cross your fingers. This usually helps you to lock in a person's aura to prevent a person's energy from affecting yours. This is an abstract theory that has been found effective over the years. Identify the kind of people who have always created stressful moments in your life. Write down a list of energy vampires affecting your life. Slip the paper list in a water bottle and then place it in a freezer. This will freeze the energy of the vampires and prevent it from affecting you.